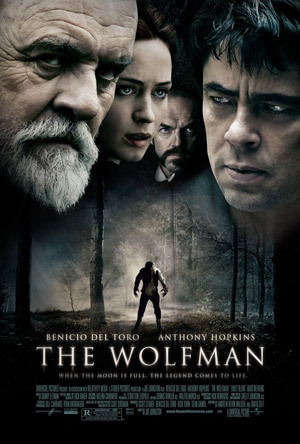 Benicio Del Toro, Anthony Hopkins and Emily Blunt star in the horror thriller The Wolfman, based on Universal’s 1941 classic film ‘The Wolf Man’ written by Curt Siodmak. Watch the movie trailers below. Lawrence Talbot (Del Toro) is lured back to his family estate after his brother vanishes. Reunited with his estranged father (Hopkins), Talbot is bitten and subsequently cursed by a werewolf. MPAA Rating: R for bloody horror violence and gore. Lawrence Talbot’s childhood ended the night his mother died. After he left the sleepy Victorian hamlet of Blackmoor, he spent decades recovering and trying to forget. But when his brothers fiancée, Gwen Conliffe (Emily Blunt), tracks him down to help find her missing love, Talbot returns home to join the search. He learns that something with brute strength and insatiable bloodlust has been killing the villagers, and that a suspicious Scotland Yard inspector named Aberline (Hugo Weaving) has come to investigate.